In January 1976 Massachusetts embraced no fault divorce. It was seven years after California was the first state to allow no fault divorces. Thirty years ago no fault divorce opponents unsuccessfully argued that the sacred institution of marriage would be destroyed if couples could get divorced without finding fault. Divorce no longer carries the social stigma that it did thirty years ago. But are we ready to allow divorce via twitter or text message (SMS)? 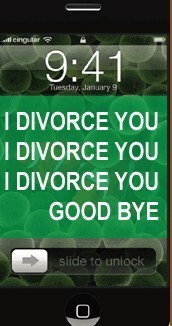 Although Massachusetts might not be ready for divorce via text message (SMS), the country of Tajikistan is. The Associated Press reported that a Tajikistan man divorced his wife via text message (SMS). Apparently this practice is quite common for Tajikistan men that have been forced to work as laborers in Russia due to a lack of work in their country. My first thought was how is this practice allowed? In the Muslim tradition a divorce is granted when a man says ‘taloq’ three times in a row and a cleric gives approval. The word ‘taloq’ means divorce. It is important to note that not all countries approve of divorce via twitter or text message (SMS). The AP report states that it is acceptable in the United Arab Emirates, Qatar, Malaysia, and Saudi Arabia. Singapore forbids divorce via SMS (as well as chewing gum in public). My only question is if a woman says alimony or child support three times, then does she get her request automatically?